Continue enjoying your favourite TV programmes with a simple, easy-to-use remote control that enables you to carry out basic functions like switching the TV on or off, changing channel and adjusting the volume fast and easily. Moreover, its buttons are large and nicely separated so that you can use the device with complete autonomy. 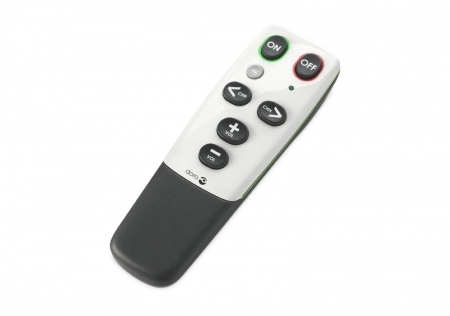 This TV remote control is recommended for those who are not too demanding when it comes to watching television. It is intended for people with low vision to have control over the basic aspects of their daily TV use. Favourite functions can be configured easily and it is especially suitable for the elderly who wish to enjoy this activity, but due to their poor sight, feel overwhelmed by the complexity of today’s remote controls and their numerous buttons and functions.